Tzaddi, the twenty-eighth path, connects Netzach and Yesod. It is the character "Tz" or "X". 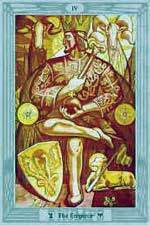 In Thelema: the Emperor, because צ is not the Star. Liber AL I:57. Traditional: the Star. Natural or Constituting Intelligence (natural consciousness, Sekhel Mutba, שכל מוטבע), because through it is consummated and perfected the nature of every thing existing beneath the Sun. The Ari teaches that צ connects Geburah to Tiphareth. The Gra teaches that it connects Netzach to Malkuth. Tzaddi is one of five characters that also has a "final" form — that is, a form of the letter that is used when it appears at the end of a word. The two forms have different enumerations, as shown above. NOTE: In Hermetic Qabalah, Tzaddi traditionally associates with the Star because צ, Tzaddi, is the eighteenth letter and the Star the eighteenth trump (counting the Fool as the first trump). However, Thelemites change this, associating Tzaddi with the Emperor. The rationale for this is explained in Crowley's book The Book of Thoth , but stems from a statement in Liber AL that צ is not the Star.